Nominations for the 2007 Professional Development Awards of Excellence are due Friday, August 31 by 5:00 p.m. The Awards of Excellence honor NAMA members based on outstanding achievement in each of the Professional Development Areas of (1) Marketing Communications, (2) Product/Species Management, (3) Public Relations and (4) Sales. Nominees come from agribusiness and related companies targeting individuals with direct planning and execution responsibilities in the respective Professional Development Area. These awards will be presented at the 2007 Agribusiness Forum, November 13-14, at the Hyatt Regency Crown Center in Kansas City. Don’t miss your chance to honor a peer! Kevin Coupe the “Content Guy” for MorningNewsBeat.com has been added to the line-up for the 2007 Agribusiness Forum, November 13-14 at the Hyatt Regency in Kansas City. Coupe will host a session on The Decision Zone: Six Issues the Food Industry Must Confront in 2008, 2009…What are the compelling issues confronting the food industry in 2008 and beyond? What kinds of companies can be successful in a tough competitive environment that continually challenges them with issues like globalization and food safety? How will you differentiate your products, services and values in an era of cutthroat competition, when customer needs and priorities seem to shift almost daily? These are among the issues that Kevin Coupe, MorningNewsBeat’s “Content Guy,” addresses each day on his web site…and they are the focus of his newest presentation. His premise: the stakes are too high, the time is too short, and the customer is too demanding for retailers and manufacturers to put off critical decisions that will define their future and their hopes for survival. Kevin Coupe is a writer specializing in creating unique portraits of “Main Street”-type businesses in the U.S. and around the world, focusing on the unique dynamic that exists between retailers, manufacturers and consumers. Working in print, video and online, Kevin captures the special relationship between shopkeeper and shopper, especially in a technological society in which the rules and roles are constantly changing. And, as a speaker on these same subjects, Kevin has enlightened and entertained audiences around the globe. For more information on the Agribusiness Forum, visit, http://www.nama.org/forum/index.html. Special thanks to Pioneer Hi-Bred Intl., Inc. for sponsoring the Forum web site. To register for the Forum, visit, http://payment.nama.org/forum.htm. Over 40 people attended the MoKan Ag Tour which was held prior to the NAMA Boot Camp on Tuesday, August 21. The tour began with a trip to Schweizers Orchards in St. Joseph, MO. The group listened to the Schweizer’s discuss their farming practices, how they handled a hard freeze over Easter that left them with no apples and peaches, and how life at the orchard works. Attendees were then given a tour of the orchard via hayride to view the different crops of pumpkins, apples, Christmas trees and peaches, as well as vegetable crops and other fruit crops. At the end of the tour, attendees were able to get a close-up of blackberry and raspberry crops and sample the fruit straight from the vines. The next stop on the tour was the Shatto Milk Company. Mr. Shatto’s enthusiasm for being a dairy farmer flowed over to the attendees as he discussed how their milk is made, including how to make the different flavors of milk they carry. Milk flavors come in root beer, orange cream, banana, strawberry and chocolate. According to Shatto, they had to cut back on making the root beer flavor because with the extremely hot summer temperatures, the cows don’t produce enough milk to keep up with the demand for the flavored milk. In addition, Shatto discussed how they clean their bottles for re-use and how they began marketing their milk. Attendees were also allowed in the barn where they learned how to milk a cow with their hands as well as how the milking machines worked. From milk to wine. The next stop on the tour was to Jowler Creek Vineyard and Winery. Jason and Colleen Gerke (MoKan NAMA members), welcomed the group with wine and discussed their vineyard, what kinds of grapes are grown and how the grapes are harvested. The Gerkes started out growing Norton vines which have shown consistency in producing a premium, red, full-bodied wine that’s loaded with tannins, similar to a wine produced in California or France. They also grow a grape variety called Vignoles as well as a third variety called Traminette, and a fourth variety known well in the old world wine regions of France called Cabernet Franc. Jason and Colleen continue to experiment with different varietals in order to perfect their wine styles. After viewing the vineyards, the group was taken to their winery where the Gerkes discussed the process of making wine. 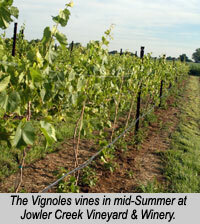 Their wines can be found in fine restaurants and wine shops around the Kansas City area. After the tour, the Gerkes treated attendees to a wine tasting of several different wines. Special thanks to the MoKan chapter for hosting this successful event! Agri-marketing professionals ranging from account executives, creatives, media professionals, sales staff and more convened in Kansas City, MO. 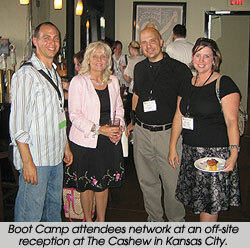 on August 21-23 for the 2007 NAMA Boot Camp. The conference provided an invaluable opportunity for attendees to learn more about the agri-marketing industry from veteran marketing professionals and, in some cases, directly from producers and growers themselves. The chance to develop valuable contacts in the industry was also hailed as a top reason for attending NAMA Boot Camp. NAMA Boot Camp offers an impressive range of targeted breakout sessions and keynote speakers that allow attendees to customize their Boot Camp experience. To learn more about other educational and networking opportunities available through NAMA contact Jenny Pickett at jennyp@nama.org. Special thanks to the 2007 Boot Camp sponsors! The 2007-2008 program year is underway and a couple of NAMA Chapters have set meetings for September and October. See What’s New in the Cornbelt! The Cornbelt NAMA chapter invites everyone to a meeting and tour at the recently opened Heartland Acres Agribition Center in Independence, IA, on Thursday, September 20, 2007. Shannon Textor, director of market development for Iowa Corn will discuss the Iowa Corn Indy 500. The event drew standing-only crowds, elected officials, national television coverage, local press stories and much attention about ethanol. Textor will share why they sponsored the race, what they did to get the most from their investment and how they catered to members, potential members and a large consumer audience. Bruce Neeley is the executive director of the Heartland Acres Agribition Center. The new $7 million attraction includes hands-on exhibits showing both old and new agricultural techniques plus a 22,500-square-foot events hall. Neeley will share the inspiration behind the new center, how funds were generated, what’s planned for the future and the initial results that they’ve seen thus far. A tour of the facility is included. Cost for this Cornbelt event is $15 for members and students and $20 for non-members. This price includes the tour and lunch. If you’d like to attend, please contact Luann Pisarik at luann@jlfarmakis.com or 319-895-6723 by Sept. 10. Mark your calendars for the next Cornbelt NAMA meeting and tour on Thursday, November 1st. It will feature speakers from Diamond V and Kirkwood Community College. The Chesapeake, Eastern and Carolinas/Virginia NAMA chapters would like to extend an invitation to everyone for a legislative meeting at the Phoenix Park Hotel, in Washington, DC on Monday, October 1. You’ll enjoy some networking time with members from Eastern, Chesapeake and Carolinas/Virginia chapters followed by a luncheon and a session with House, Senate and USDA representatives who will review key farm bill and farm policy initiatives. More information on this event and how to register will be available soon, keep checking the NAMA Calendar for up-to-date information. If your chapter has an upcoming event planned that is not listed on the NAMA Calendar, please send the program information to Kathi Conrad at the NAMA Office at kathic@nama.org. 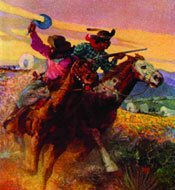 An Epic Tale of Guts and Glory! It’s time to start putting your entries together for the Best of NAMA awards program. Best of NAMA honors the best work in agricultural communications. Actually, the Best of the Best, since companies and agencies must first qualify through a regional competition in order to advance to the national level. Regional awards ceremonies will be held in January. The national awards ceremony will take place April 16, at the Hyatt Regency Crown Center in Kansas City. Best of NAMA entries are sent directly to the national NAMA office and judged by industry professionals at a regional level for possible advancement to the national competition. A minimum point standard will be used at the regional level. If you place first or merit at the regional competition and score above the minimum point standard, you are eligible to advance to the national competition. The NAMA office will notify you by February 1, 2008, regarding entries eligible for advancement. An entry fee at the regional and national level is required. Your local chapter receives $25 per regional entry. So, enter your work in Best of NAMA and support your local chapter at the same time. If you’re a NAMA member, you’re eligible to submit your company’s communications materials produced for first use in 2007. The deadline for submitting your entries is Friday, October 12. Special thanks to High Plains/Midwest Ag Journal for sponsoring the Best of NAMA Call for Entries. Special thanks also to McCormick Company for the design of the Call for Entries. For categories and information on how to submit your entry visit, http://www.nama.org/amc/bon/index.htm. To download the entry form in an Adobe .PDF format visit, http://www.nama.org/amc/bon/entryform.pdf. To download the entry form in a Microsoft Word document visit, http://www.nama.org/amc/bon/entryform.doc. Exactly what is 40 kilometers from nowhere and just around the next bend? If you guessed Dog River, home of the Corner Gas crew, you’d be right on the money. If you guessed Rouleau (the real Dog River), Eyebrow, Elbow, Beechy, Riverhurst, Montmarte or any other home grown hamlet where life plays out exactly like Corner Gas, you’d be right again. And if you guessed CAMA Gas, 2007 Best of CAMA, Canada’s top awards program for agri-markets and friends, you win the biggest prize of all. You’ve worked hard all year and now it’s time to show the fruit of your labors. Think about the great work you’re doing . . . strategies, publications, television, radio and print advertising, digital media, special events . . . whatever you’re proud of and put your talent on display. Winning a Best of CAMA award builds reputation for you and your organization and shows beyond the shadow of a patch of saskatoon berries that you have the knowledge and confidence to put yourself out there. Entering your work in the Best of CAMA is a terrific growth opportunity for every agri-marketing and communication professional, whether you’re still wet behind the ears or one of our ethanol-seasoned vets. You’ll learn more about being a winner simply by putting your entry together, sharing ideas and networking with colleagues across the country. Our stage manager is downright handy with wires and bulbs and if you win, the spotlight will follow your dancing, exuberant self to centre stage at the Best of CAMA celebration on November 14 at the Conexus Centre in Regina. Think of the applause! Imagine what winning does for your resume. Is Best of CAMA challenging? Absolutely! Is it achievable? You bet! Winning a CAMA award is a mark of excellence in our profession and participating is a mark of your commitment to give ‘er snooze, put yourself out there and strive for excellence. So, grab your Hungry Man TV dinner, run to your computer and boot up the Best of CAMA 2007 website at www.bestofcama.com. Entry deadline is close of business, Monday, September 24. By the way, that’s close of business in Saskatchewan where daylight savings time is a myth because roosters crow at the crack of dawn regardless of what the clock says. At least, that what they tell us. Questions? Please e-mail Claire Watson at claire.watson@fcc-fac.ca. Help us grow the 2007 Best of CAMA competition beyond the wildest imagination of any double-dog-dare-you, prairie-tough marketing professional. And that’s pretty wild. We’re looking forward to a bumper crop of entries! There’s only 2 weeks left to nominate a peer for the Professional Development Awards of Excellence. These awards will be presented at the 2007 Agribusiness Forum, November 13-14, at the Hyatt Regency Crown Center in Kansas City. These awards honor NAMA members based on outstanding achievement in each of the Professional Development Areas (PDA). Awards of Excellence will be presented in the areas of (1) Marketing Communications, (2) Product/Species Management, (3) Public Relations and (4) Sales. Nominees for the Awards of Excellence must be NAMA members. Nominators should target individuals with direct planning and execution responsibilities in the respective Professional Development Area from agribusiness and related companies. If you have any questions regarding these awards, please contact Jenny Pickett at jennyp@nama.org.To download the nomination form in an Adobe .PDF format, visit http://www.nama.org/awards/PDAapplication.pdf. It’s not too late to register for the NAMA Boot Camp that will take place next week, August 21-23. As an attendee of the Boot Camp you’ll participate in panel discussions which include producers in the ag industry as well as what to expect from clients and agencies. In addition, you’ll participate in sessions on how to network effectively, successful agritourism, how to develop a communications plan, maximizing your trade show ROI, shifting demographics in agriculture, new media, Ethanol today and tomorrow and a farm bill update. In addition, you’ll have plenty of networking opportunities. As an added bonus, all attendees will receive a notebook packed with ag terminology and facts as well as case studies and speaker presentations. Attendees will also receive a “goodie bag” filled with information and premiums provided by our Boot Camp sponsors. 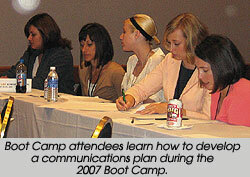 Visit http://www.nama.org/programs/bootcamp.htm for the NAMA Boot Camp schedule and more about the sessions. 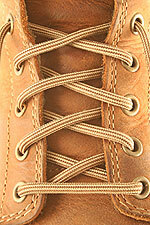 Register now for the Boot Camp at http://payment.nama.org/bootcamp07.htm. The MoKan NAMA chapter would like to invite you to the Boot Camp Road Trip. It’s one day only, August 21. Consider it your opportunity to get immersed in local agriculture without having to break a sweat. The bus will depart the Hyatt Regency Crown Center at 7:30 a.m. on Tuesday, August 21. Cost for the trip is $50.00 (member and non-member). Schweizer Orchards in St. Joseph, MO. 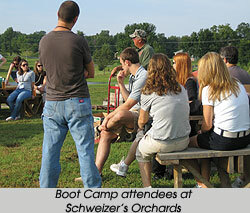 Schweizer Orchards is a family owned business producing high quality River Bend Apples for more than four generations. At their St. Joseph retail location you can find freshly picked seasonal fruit, produce and a large selection of jams and jellies. 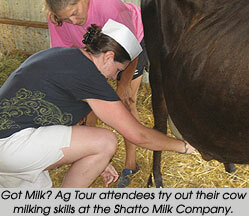 The tour’s next stop will be the Shatto Milk Company in Osborn, MO for a boxed lunch and tour. Shatto is a family owned dairy and processing facility. Shatto Milk Company products can be described by one simple statement that they have adopted as their motto, MILK AT ITS FINEST. The last stop will be Jowler Creek Vineyard & Winery in Platte City, MO. 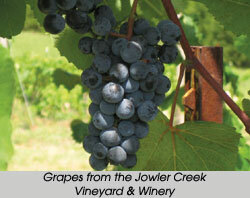 Jowler Creek Winery is the newest boutique vineyard and wine producer in the Kansas City region. Owners and MoKan NAMA Members, Colleen and Jason Gerke, grow grapes and produce hand-crafted wines that blend genuine quality with creativity and fun. Breakfast, lunch and plenty of cold drinks will be provided on the tour. Expect to return to the hotel by 4 p.m. Please register for the tour at http://payment.nama.org/bootcamp07.htm.